We offer a standard formula and a lead free crystal formula. 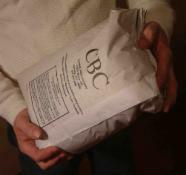 CBC glass batch is packaged in 25 lb bags designed to be charged in the bag . We also offer custom mixing and formulation. · Standard formula: COE 98 ±1 25-300 c / 96 ±1 0- 300 c giving a good fit with most color rods. · Comes in 25 lb bags ready to be charged intact. · Less corrosive to refractory, which reduces cords and gives longer pot life. · Easy melting temps 2200-2250 F, Fining 2300-2350. Standard Formula .44cents / lb FOB Corning NY.